Approximately 2 species in Santa Cruz County. Cystoderma is a small genus of white-spored fungi that produce small, golden-brown to beige colored fruitbodies that have very granular exterior surfaces. The species in this genus are saprobic, and occur primarily (if not exclusively) under conifers. 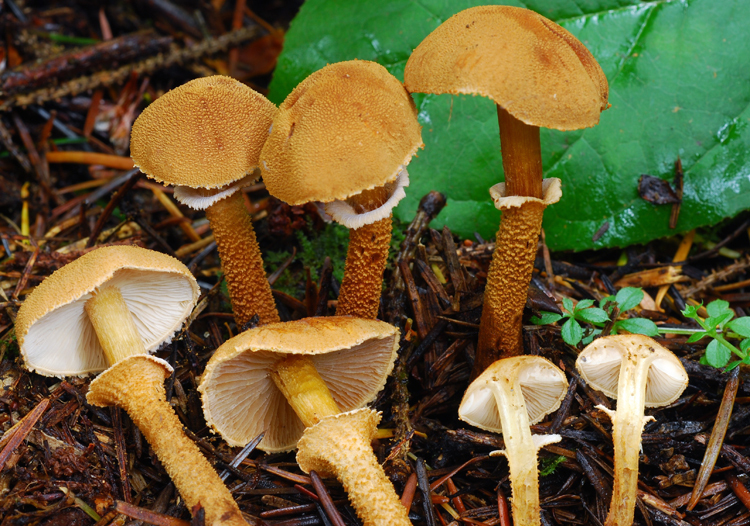 Only two species are known from our general area, and while both likely occur in Santa Cruz County, only one (Cystoderma fallax) has been confirmed. Identification of the genus is straightforward: the granular rather than scaly texture and golden-brown colors distinguishing the fruitbodies from other genera that share the white gills and weak to pronounced partial veil. Some of those include Lepiota, Cystolepiota, and Leucocoprinus. Separation of the two common species on the west coast is primarily based on examination of the partial veil (weakly defined or persistent and sheathing? ), but size and stature, coloration, and possibly habitat can also be used to support identification, microscopic characters can be used to resolve ambiguous cases. * This species may occur in the county but no verifiable collection has been made.